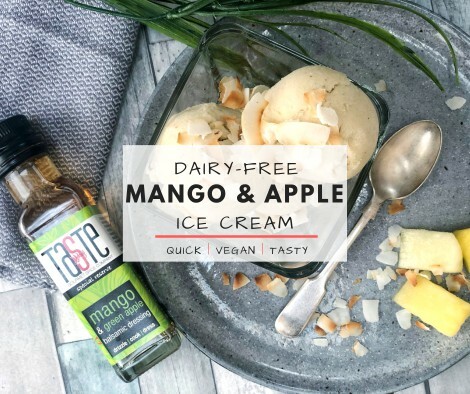 Our Mango & Apple Dairy-Free Ice Cream is an incredibly quick, dairy-free alternative to traditional ice cream. The addition of the Mango & Green Apple White Balsamic Vinegar might seem unusual, but the natural sweetness & flavour of the fruit really shines through & balances everything out so it’s fruity, creamy & refreshing. This is a perfect way to use up bananas that are beginning to over-ripen; instead of wasting them, peel, chop & freeze them & you’ll be able to make this no-fuss dessert at a moments notice. We’ve usually always got frozen fruit ready for a quick smoothie, so this is a delicious alternative when you fancy a treat! Using our award-winning Aged White Balsamic as the base, our Mango & Green Apple White Balsamic Vinegar is a light, fresh dressing all by itself, perfect for salads & fish. The ripe, heady creaminess of the mango pairs with the crisp, almost-grassy-sourness of fresh apples to create an explosion of zingy, fresh & fruity flavours! Using it here as a dessert shows how versatile it is. add a few drops of Rich Raspberry Aged Balsamic as you serve for a pure raspberry kick!